During the long summer of 1849 there was an unbroken line of wagons reaching from horizon to horizon. Cholera, scurvy, dysentry, accident, thirst, hunger, fatigue, Indian attack, quarrels, discouragement and other ills plagued these trains. As in other years, all of these obstacles were offset by the hope for a better future in the form of gold or land.The majority of this endless line of humanity was aimed toward the promise of gold and riches in California. It was estimated that over 35,000 individuals took part in this great overland migration. Of these, only a very few turned off for Oregon. Below is an incomplete list of the emigrants and trains of 1849. All women are listed by their maiden name (if known) EVEN if they were married at the time of emigration. *2) Bvt. Col William W. Loring with companies A, D, F, H, K set out May 10th for Ft. Kearny with 700 horses, 171 wagons, 1200 mules and some oxen. He reached Ft. Kearny on May 31 where he was joined by Bvt. Major Charles F. Ruff and Company I. They began their trek to Oregon arriving at Ft. Laramie on June 22 and at Oregon City on the 8th and 9th of October. The companies were stationed at the Columbia Barracks in what is now Clark Co, WA. BICKERS, Henry C. (1817- ): m'd 1852 Mrs. Melinda Brown; s/o Benjamin and Joanna (Martin) Bickers; is shown working as a carpenter in Marion Co, OR in the 1850 and 1860 census; by 1870 is shown in San Diego Co, CA where he is listed as a gold miner. After 1870 he does not show up in the census records. Henry was the father of four children (Andrew J., Horace E., Mary, and William H.); wife was an emigrant of 1851 with her first husband, Thomas J. Brown. BROOKS, John M.: m'd HARPER, Martha Rebecca; s/o John M. and Betsey (Courts) Brooks Jr.
BRUTSCHER, Sebastian (1826-1922): crossed the Oregon Trail in 1849 with Col. Loring's Regiment of Mounted Riflemen; was discharged at Oregon City and settled in Yamhill Co.
BRYANT, William P.: the first Chief Justice of the Oregon Supreme Court; appointed by Pres. James K. Polk in 1848 when the Oregon Territory was established; in 1850 he purchased an island and milling operation from George Abernethy that was also claimed by Dr. John McLoughlin; presided at Leander C. Wallace murder trial at Ft. Steilacoom. GRAZER, Jacob (1825-1886): m'd 1852 GRIFFIN, Lucy; listed in Brazen Overlanders of 1845 and Genealogical Material in Donation Land Claims as emigrant to Oregon but he did not arrived in US from Germany until 1847. The abstract of Donation Land Claims may have been a misreading of his year of arrival due to difficult-to-read documents and was then carried forward into other sources. A biography mentioning one of his daughters and his obituary both state he was a pioneer of 1849. HILL, Isaac: m'd 26 Dec 1826 FINE, Elizabeth; returned east and emigrated again in 1852 bringing his wife, five children and other family members. See 1852 listing. HILL, James: m'd 1849 SMALL, Jane; James was originally emigrant of 1847. See his bio under that year. 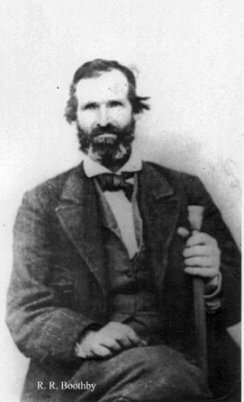 HUMASON, Orlando: the "Father of Wasco County", He left Ohio in the winter of 1849 and went by the southern route through Texas & Mexico ending up in California in 1850. 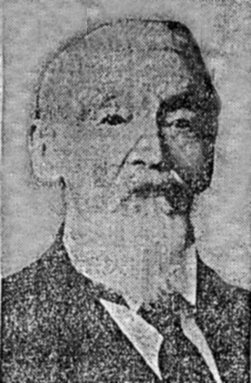 He eventually moved to Oregon in the spring of 1851, settling initially in Oregon City then taking out a DLC in Yamhill County later that year. 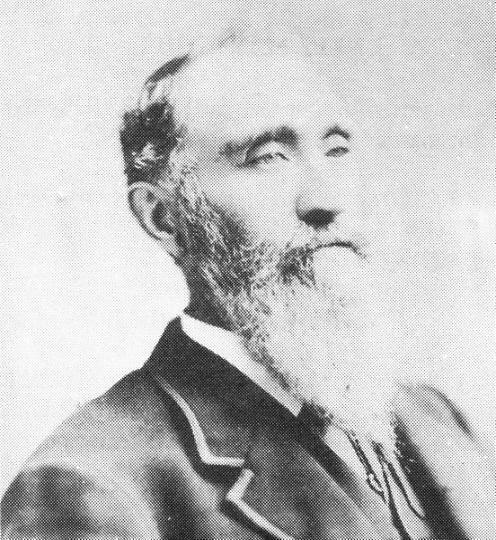 He later served in the legislature, as Wasco County judge, Sheriff and Mayor of The Dalles, etc. *2: MULLINS, Charles (1828- ): U.S. Mounted Riflemen, soldier from D.C.
OWENS, Mary Susan ( -1850): m'd c1843 GIBSON, Randolph C.
*2: RUFF, Annie: m'd RUFF, Charles F.
*2: SIMENSON, Elizabeth (1805- ): m'd SIMENSON, John S.
"James Hill was the seventh child of Rev./Col. Joab Hill (1775-1847) and Elizabeth Lane Hill. He was born 5 October 1818 in Sweetwater, Monroe County, Tennessee. The family moved to McMinn County on a land grant given to Joab Hill for services in the War of 1812. They then moved to southeastern Iowa for one winter, 1839, then over the state line to Clark County, Missouri, because they could not keep their slaves in Iowa. Their first home in Missouri was a large log cabin located northwest of Revere about five miles. 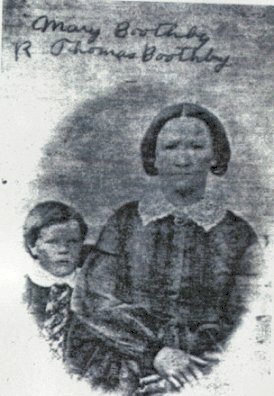 James returned to Tennessee and married Jane Small Johnson in McMinn County on 4 February 1849. 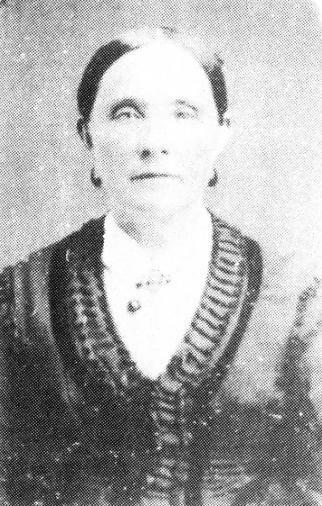 Jane was born 21 January 1830 in McMinn County, Tennessee, the daughter of Rev. James Small and Mary Ann Wallace. 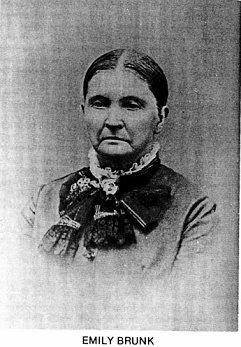 Jane Small's brief first marriage was to Frederick M. Johnson, 10 Feb. 1846, Meigs County, Tennessee. James and Jane made their wedding trip to Oregon. They accompanied his three brothers, Isaac, Russell, and George, and his mother, Elizabeth Lane Hill, and his sister Maria Louisa Kelly and three nephews of whom he was very fond, LaGrand Hill, Isham P. Keith, and Sterling Hill. 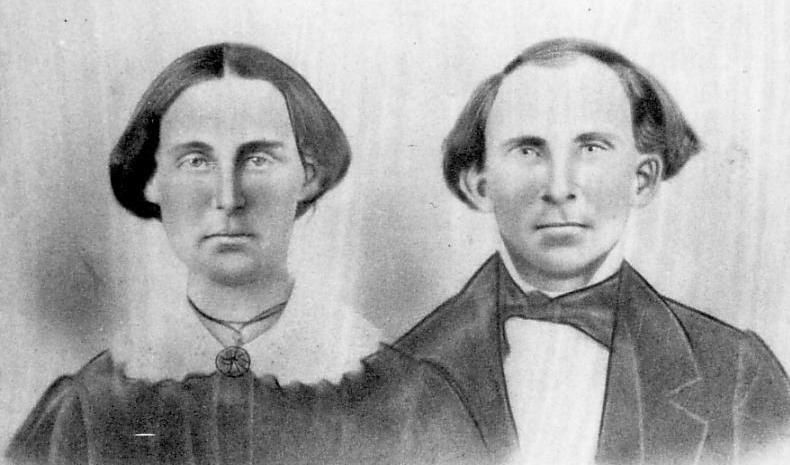 By the 1850 census, James (age 33) and Jane (age 20) were in Linn County, Oregon, with his mother, Elizabeth (age 65) and two brothers, Isaac and George W., living with them. Brother R.T. Hill was living next door to them and to the Chamberlain family, including the wife, Adeline Cheadle Chamberlain, whom he later married. 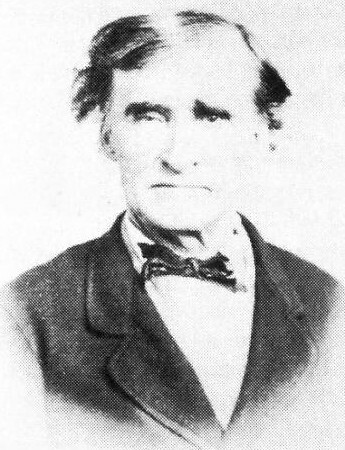 James' daughter wrote, "in 1852 Father and Mother with Shasta Ruby returned to Missouri. Father had promised Mother's father, Rev. James Small, that he would bring Mother back when he made enough money to start in business." So they left Oregon, but later regretted it because they felt their children would have had an easier life there. 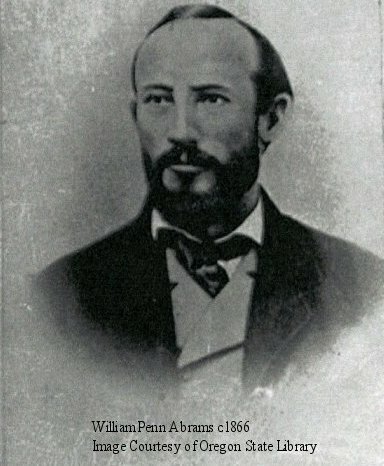 During the Civil War, James took his family to Texas "for the sake of peace" -- to escape the fighting in Missouri. James and Jane Hill located ten miles southwest of Springfield, Missouri, in Greene County on Grand Prairie in the beautiful Ozark country. Jane died on 20 March 1879, and James died 20 January 1882 in Ash Grove, Dade County, Missouri. They are buried on Rev. James Small's homestead. *2: SMITH, John (1829- ): U.S. Mounted Riflemen, soldier from D.C.
*2: STEMERS, August (1815- ): U.S. Mounted Riflemen, soldier from D.C.
STILLMAN, Edward D. (1828- ): crossed the plains as a wheelwright for the U.S. Mounted Riflemen; after arrival was engaged to repair and run the McLoughlin sawmill for General Lane. TALBOT, C.B. 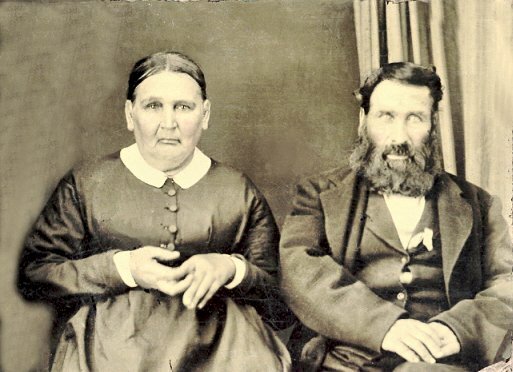 (1840- ): oldest s/o Mr. and Mrs. Talbot; claims to have been the first newsboy in the NW, working first for the Oregonian and eventually adding other newspapers to his list. 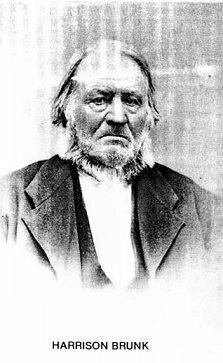 Mss #60, Oregon Historical Society;David Egbert Pease, departed St. Joseph, MO 28 Apr 1849 and arrived Willamette Valley 05 Sep 1849; traveled with "Green and Jersey County Company"